To begin with a story: Our grandson Taylor was deeply immersed in a video game on his laptop. 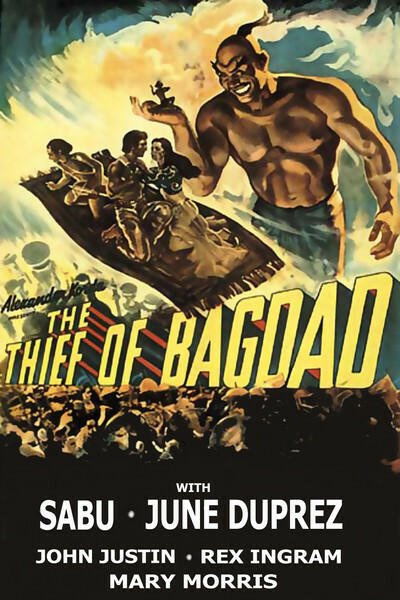 I began to watch "The Thief of Bagdad" on DVD. At first he ignored it. Then I saw him glancing at the screen. Then he closed the laptop and watched full time. During the spider sequence, only his eyes were visible above the neck of his T-shirt. "That was a good movie!" he told me. "What did Taylor say when he found out it was almost 70 years old?" his mother, Sonia, asked me. "I didn't tell him," I said. This 1940 movie is one of the great entertainments. It lifts up the heart. An early Technicolor movie, it employs colors gladly and with boldness, using costumes to introduce a rainbow. It has adventure, romance, song, a Miklos Rozsa score that one critic said is "a symphony accompanied by a movie." It had several directors; as producer, Alexander Korda leaped from one horse to another in midstream. But it maintains a consistent spirit, and that spirit is one of headlong joy in storytelling. The story is loosely borrowed from Douglas Fairbanks Sr.'s "The Thief of Bagdad" (1924), itself a great film. Fairbanks Jr. told me it was his father's favorite. One major change is crucial: In the silent film, the thief and the romantic lead were one and the same, played by Fairbanks. In the 1940 film, they are made into two characters. The thief, Abu, is played by the Indian child star Sabu, then about 15. The king, Ahmad, is played by John Justin with a Fairbanksian mustache. This is an invaluable change, for both dramatic purposes and practical ones: The silent character needs no one to talk to. The 1940 characters become allies drawn from the top and bottom of society, making Sabu essentially the star of the film, although he doesn't receive top billing. The most compelling character, as he should be, is the villain Jaffar, played by the German emigre Conrad Veidt with hypnotic eyes and a cruel laugh. The beautiful, passive heroine, a princess desired by both men, is played by June Duprez. The story in my mind moves from one spectacular special-effects sequence to another: the Sultan's mechanical toy collection. The flying horse. The storm at sea. The goddess with six arms. The towering genie released from a bottle. Abu's assault on the temple that contains the All-Seeing Eye. His climb up a mountainous statue. The battle with the gigantic spider. The flying carpet. Half of the shots in "Citizen Kane" used special effects, according to Robert Carringer, who wrote a book on the film. There is rarely a shot in "The Thief of Bagdad" without them. The film was a breakthrough in technique and vision, influential in shaping the entire genre. There are few effects in "Star Wars" (1977) that cannot be found in "Thief." Some of them, such as blue screen, were still being perfected. Other effects, such as matte paintings, had been in use for years. The Criterion DVD offers interviews with three effects experts, including Ray Harryhausen, who discuss the film's techniques. It is especially eye-opening to see stills revealing the "hanging matte" technique, which creates a background or completes a composition by suspending a matte painting in front of the camera. The camera's 2-D eye is fooled by the painting into making us see foreground as background. Other techniques are simplicity itself: The genie is made to tower over Abu by using an optical printer to combine a shot of the genie (Rex Ingram) close to the camera, and Abu hundreds of feet away. Both are filmed from a static camera on the same beach. The use of blue screen may seem primitive compared to today's computer-generated animation, but it has the advantage of using real-world subjects. The flying horse, for example, is a real horse, with a real actor mounted on it. The flying carpet is a real carpet, with Abu standing on it. Both the genie and the thief seem real in all of their shots, because they are. The point here is that all of the effects, supervised by the wizard Lawrence W. Butler, are used to further and deepen the story. Consider the remarkable beauty of several scenes showing magnificent cities climbing hills in the background. The cities may be tinted peach or blue, which makes them all the more fantastical. They are all mattes. Once on a visit to the Disney Studios, I met the famous matte artist Peter Ellenshaw, who was a young assistant artist on "Thief." He told me how his paintings used not only a forced perspective , but such devices as deliberate blurring to create the illusion of depth. When two lovers are standing in a balcony in front of a matte cityscape, it would be a mistake to make the painting in a photo-realistic style. Its indistinct qualities make it seem farther away. Korda, a Hungarian emigre who had earlier run Britain's Denham Studios, was now an independent, powerful in the Mayer, Selznick or Goldwyn mode. He used his brother Vincent as his art director, his brother Zoltan as a director. The already legendary art director William Cameron Menzies also worked on the film, and is said to have directed some scenes. Together they made a film of breathtaking beauty. It is done so well that it does not date. Never mind that today similar vistas could be painted with CGI. These are so gorgeous that we cannot imagine them being improved. Korda often employed others from overseas. Veidt (1893-1943) was a famous German silent actor who fled Hitler in 1933, became a British citizen, worked in Hollywood, was a major star. Sabu (1924-63) was born in Mysore, India, and as a boy was a servant for a maharajah. In 1937, he was cast by Robert Flaherty in the title role of the quasi-documentary "Elephant Boy," an international hit. He was signed by Korda, for whom he made "The Drum" (1938), "Thief" and the great success "Jungle Book" (1942). Rex Ingram (1895-1969), the genie, was a well-known African-American stage and screen actor who graduated from Northwestern University. He achieved fame in films like "Green Pastures" and "Cabin in the Sky." The energy centers on the film are clearly supplied by Sabu and Veidt, as a boy bubbling with enthusiasm and innocent guile and a man steeped in bitterness and cruelty. Both performances are perfectly pitched to the needs of the screenplay. The romance between Duprez and Justin, as the princess and Ahmad, is rather bloodless, centering on abstract vows; their greatest passion is shown in the scene where they're bound to opposite walls, and under sentence of death. The same low-flame romance was mirrored in Disney's "Aladdin" (1992), greatly influenced by both versions of the "Thief," combining Abu and Ahmad as "Aladdin." Although the film had so many directors (including Michael Powell, two Kordas and Menzies), it seems the work of one vision and that must have been Korda's. It remains one of the greatest of fantasy films, on a level with "The Wizard of Oz." To see either film is to see the cinema incorporating every technical art learned in the 1930s and employing them to create enchanting visions. Today, when dizzying CGI effects, the Queasy-Cam and a frantic editing pace seem to move films closer to video games, witness the beauty of "Thief of Bagdad" and mourn. Note:You may watch the Criterion Collection's DVD of "The Thief of Bagdad" online for $5 atwww.criterion.com/films/544.